"We're handling volumes 60% higher than we did last year without an increase in personnel"
This report details a fulfillment center for on-line store and catalog customers. 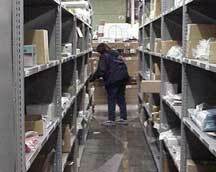 The facility is designed for each-pick rather than the case picking done at the company's retail distribution center. The Container Store is the national leader in home storage and organizational products. This growing retailer helps customers organize their homes and lives. It sells products designed to organize virtually every room and every space, including closets, kitchens, gift packaging, shelving, hooks, boxes, travel, offices, closets, trash, collections, bath, storage, laundry and more. Its business is expanding with 23 retail stores and its on-line store, where customers can configure home storage areas with innovative storage products. The company continues to expand strategically: retail sales have increased at a rate of 25% a year. When the Container Store's on-line store opened for business, it drove home the need to split operations from its Dallas retail distribution center. "Our business was just starting on the Internet," said Bill Baron, Container Store Distribution Director. "We had a small each-pick fulfillment area in our centralized retail warehouse operation that supported the catalog business. We decided to re-tool our fulfillment process once we looked at the projected demands of our Internet business." Pack station configuration was critical to The Container Store's success. Necessary materials surround the packer, making the process faster and more effective. "We knew we had to improve the packing area and the picking processes," said Baron. The Container Store team realized that its retail distribution center did not meet the demands of catalog and Internet fulfillment. Pickers were walking up to 800 feet from pack stations to get some products. "We found that we were also spending a lot of time walking to get packing supplies," Baron Said. Fulfillment for retail stores and on-line customers was so different that the logical choice became a separate facility. "We didn't feel we had the room to grow at our retail distribution center. And we'd already secured this building for reserve storage, so it was a logical choice." Kevin Marlow, The Container Store Systems Operation Analyst added: "The retail facility was set up to pick for stores in case quantities by the truckload. Each-picking in that center interfered with the case picking operations. We needed to change our processes because it was originally designed for store replenishment." The Container Store built the system to accommodate 1,500 orders a day. The company's elfa product sale occurs after Christmas through January. The elfa product is a closet storage solution of wire shelving, tracks, standards and drawers. During this sale, customer order volumes are three times greater than average and the fulfillment systems needed to be able to handle these peaks. Many companies would design what management feels is the best solution and implement it, but the Container Store is unique in its approach to nearly every decision the company makes. The company has topped Fortune Magazine's list of "100 Best Companies to Work For" for two consecutive years. "We spent months seeking feedback from and working with the employees asking, 'What do you like, what do you dislike, what do you use 100% of the time, 90% of the time, what do you need to do your job?'" said Baron. "Our employees designed the packstations. They perform the job every day. They are the experts, so who better to tell us what would work?" "Communication is leadership," added Marlow. "A person on the shipping floor should understand the company as well as a vice-president." The Fulfillment Center features 8,500 pick locations and 7,000 active SKU's. At peak times, an additional 1,200 SKU's can be added with gift-wrap and other items. The center can handle up to 1,500 orders a day. 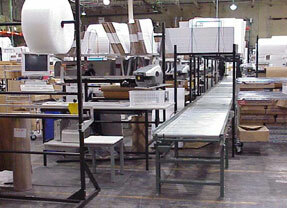 Flow rack was used for the facility's fastest-moving items, making for easy access and replenishment. The top 200 SKU's were assigned to flow racks. Other items were assigned to static industrial shelving. A 6-SKU per section format was used for 180 SKU's that were deemed fast-moving basics. A 7-SKU per section format was used for 4,000 less active SKU's. Larger, bulkier items were stored on pallet racks. 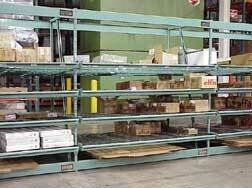 One configuration stores 500 SKU's of items too large for shelving or flow racks. Another was designated oversized storage for 550 SKU's. Finally, a pallet configuration was developed for the slowest 1,200 SKU's. "Working with Cisco-Eagle, we were able to find a lot of creative space using either pallet racking or tunnels and racking over the dock doors to find places to store things," noted Marlow. All picking is performed using RF devices. Once orders are picked, they are staged at modular packing stations. Each station is equipped with a document shelf, carton rack dividers, bubble wrap dispenser and cutter, computer screen platform, mouse tray, and tape dispenser platform. 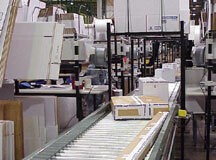 The packing personnel utilize these stations to quality-check and pack each order. Once packed, cartons are conveyed to manifest stations. After being manifested, orders are palletized and staged for shipping. "We spent a lot of time looking at packing stations to make them more ergonomic," said Baron. "We worked with Cisco-Eagle looking at different options for the pack stations, looking at our supply, utilization, and space requirements." After the product reaches the pack station, The Container Store's warehouse management system (WMS) helps ensure it is packed and shipped correctly. "The packer generates a container content summary. It shows the line item notes, order notes, or instructions to add catalogs. We can print that off, pack the order, and ship-stage the container. If the order is more than one box, the packer prints a content summary for each box," said Marlow. Most shipments tend to be multiple boxes, and the customer wants to know what is in each box. These summaries help ensure that everything is picked properly. When the last carton of a customer's order crosses the manifesting station, the system prints an order summary that is attached to the outside of the carton and sent to the customer. Upon confirmation of manifesting the last carton, The WMS closes out the order. The company makes sure that on-line customers know when their order is shipped by providing them complete information from start to finish. "Our host will send an e-mail to the customer letting them know the tracking numbers and carton contents," said Baron. With the new fulfillment center, The Container Store has created a facility that strongly supports the each-pick requirements of Internet and catalog fulfillment. 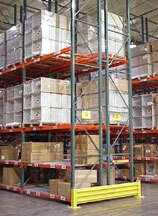 The fastest-moving items in the facility were put in flow racks. Items were then classified and stored in either shelving or pallet racks, depending on frequency, size and other factors. "Everything is much closer to the operation," Baron commented. "Before, we had product as far as 800 feet away from the packing area. The first few days of picking in the new fulfillment center amazed us. All picking zones are within 100 feet of the pack stations. The flow around the pack stations and the operation are much better. We've eliminated a lot of travel time in the process." The Container Store constantly looks for ways to improve its operations, and the operational flexibility of the new center is a major factor in its success. "We've changed some of our initial assumptions about the packing process and the needs of the packer," said Marlow. "Having the modular pack stations made it easy to make changes to our process. We could change the arrangement of supplies at the station as needed." The improvement at the pack stations was especially noticeable. All of the supplies a packer needs are in a 180-degree arc around them. "The biggest time saver at the pack stations was having the boxes overhead and over the conveyor," Baron said. Previously the company had a central location for all of its packing boxes, so packers had to walk to get what they needed. "Now it's all within their reach. Our packers tell us it's more organized and we get product out faster." "Everything was in the top range we expected," Marlow added. "The Cisco-Eagle team was attentive to our requirements. You have fits and starts that no one can control on a project like this, and Cisco-Eagle adapted to the situation. We didn't have any snags in the installation." "We're handling volumes 60% higher than we did last year without a significant increase in personnel," Baron said. "Even though we're doing more, it feels less intense than it used to because of the way the new system flows."